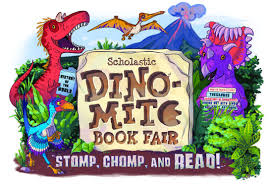 A Dino-Mite Book Fair is coming to the Three Rivers Educational Campus the week of March 4-March 8. All of your favorite characters including the following: Elephant & Piggie, Dogman, Fly Guy, Pete the Cat, Dumbo, Fancy Nancy, American Girl Wellie Wishers, graphic novels, Magic Treehouse, Wings of Fire, I Survived, biographies, American Girl mysteries, and lots of non-fiction for readers of all ages will be available for purchase. The book fair will be open during regular school hours. Students may visit during their library class, study hall, recess, and lunch. For P.T.O. Family Night Wednesday, March 6, 6-8pm, Clifford will be making a special appearance. Be sure to stop by the media center to discover your next favorite book! If you cannot visit the book fair on TREC campus, please order online via the Scholastic icon on the Three Rivers Local School District Media Center's webpage.